Home > JAN 2018 > Mr. Santhosh Kumar quits JLL, joins Anuj Puri’s ANAROCK as Group Vice Chairman..! Mr. Santhosh Kumar quits JLL, joins Anuj Puri’s ANAROCK as Group Vice Chairman..! Real estate industry veteran Santhosh Kumar today joined Anuj Puri’s new age real estate firm ANAROCK Property Consultants as Group Vice Chairman, after more than a decade with international real estate consultancy JLL India as CEO - Operations. He will be based out of ANAROCK’s Gurgaon office, with ANAROCK’s nine India offices, Dubai office and Finance reporting directly to him. A long-standing associate of Anuj Puri, Santhosh Kumar was closely involved in the merger of Jones Lang LaSalle and Trammell Crow Meghraj (TCM) which created the largest international real estate consultancy in India. As CEO of Operations, he had P&L responsibility of JLL India's 11 offices, ensuring their seamless business operations and growth. He has over 20 years of hands-on experience in Indian real estate. "Santhosh’s domain expertise, experience and impeccable relationships with the leading real estate players are invaluable assets for the Firm", says Anuj Puri, Chairman – ANAROCK Property Consultants. "With his appointment, I tick off a major item on my wish list of top-notch real estate operatives to lead ANAROCK to become a formidable institution in Indian real estate. Our pan India operations are now in the most capable hands, and the key cornerstone of our ongoing expansion and growth firmly in place." As ANAROCK's Group Vice Chairman, Santhosh Kumar hits the ground running and has assumed all operational responsibility for the Firm. "Given my long personal association with Anuj and our partnership being a tried-and-tested success formula for over two decades, this move is nothing but a natural progression for me," he says. "Also, the timing is most vital in my point of view. In the aftermath of DeMo, RERA and GST, Indian residential real estate is a battlefield from which only the fittest - be it developers or consultants - will emerge and flourish. The current residential ecosystem throws up unique opportunities and challenges, and ANAROCK's strong market positioning with digital and offline consultancy support is the key to addressing both." He adds, "There are more than 7 lakh unsold housing units across top 7 cities of India. With so much supply stacked up and more hitting the market, there is a tremendous need for transparency-oriented real estate consultants to guide homebuyers and investors to the best opportunities. Demand is plentiful, but so is uncertainty and, in some markets, outright mistrust. ANAROCK will leverage its strong reputation for transparency and digital technology to bridge the trust and information gaps and give buyers fully-vetted options from reputed and reliable developers that they can invest in with complete confidence." 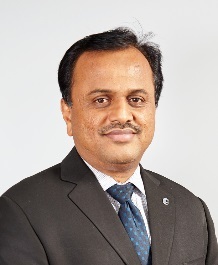 Santhosh began his career in 1998 as Finance Manager with Chesterton Meghraj, was elevated to Chief Finance Officer in 2000 and became a member of the Board of Chesterton Meghraj to advise on key strategic planning issues and make recommendations on major business initiatives and financial decisions. From 2002, he managed business operations for property consultants Trammell Crow Meghraj (TCM) in Northern and Eastern India and was elevated to Chief Operating Officer. He is a Master of Commerce from the Delhi University, Associate of Institute of Cost & Works Accountants of India (AICWA), Member of the Real Estate Committee of the Federation of Indian Chamber of Commerce of India (FICCI) and Member of the Indian Cancer Research Society. About ANAROCK Property Consultants Pvt. Ltd. The ANAROCK Group is one of India’s leading real estate services company having diversified interest across real estate value chain. Our Group Chairman, Anuj Puri is India’s leading thought leader in the real estate industry. He is regarded amongst the most respected leaders and an acknowledged expert on India’s real estate opportunities both in India and across the globe. With over 27 years of illustrious journey, Anuj Puri was the former Chairman & Country Head of JLL India. ANAROCK Group’s key strategic business units comprise of Residential business: broking & advisory services to clients; Investment business: debt, equity and mezzanine funding and Research & Consulting business. ANAROCK Residential business team comprise of industry’s finest residential real estate professionals who understand the ever-changing consumer needs and market trends. Our experience and expertise gained through serving some of the most reputed developers, corporate houses, portfolio investors and individual investors make us the unchallenged residential real estate market leader in India. ANAROCK’s Investment arm has built a revolutionary business model of bulk-purchasing residential apartment inventory through a proprietary investment fund. With a growing team of 1000 professionals, ANAROCK operates in all key property markets across India - Mumbai, Chennai, Bangalore, Gurgaon, Noida, Hyderabad, Kolkata, Pune and international presence in Dubai. With in-depth market information, quality advice and developer tie-ups for optimal deals, we have been serving the industry since 2011. ANAROCK is committed to consistently deliver optimal value to our clients from the base of our core promise - Values over Value.